In the Day When I Cried Out was commissioned by First Night® Pittsburgh. Based on the Psalms of David, the work also incorporates original text by Patrick Polk and Lucas Richman. The listener is taken on a spiritual journey from despair to realization and hope, personified by the vocal soloists and illuminated by the chorus and orchestra. 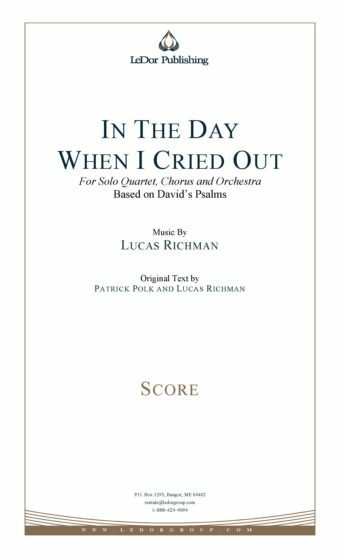 The world premiere performance of the In the Day When I Cried Out cantata, took place on December 31, 2000, with the composer conducting the First Night Celebration Gospel Choir and the First Night Orchestra. Ideal for Martin Luther King, Jr. Day concerts, this moving work blends the classical orchestra with traditional gospel styles to describe the search for spiritual guidance, culminating in a thrilling, hand-clapping finale.